There’s a lot on our collective plates right now. Davey the Hubbers accepted a new position as the executive chef of a new restaurant that opened officially yesterday (!!!). 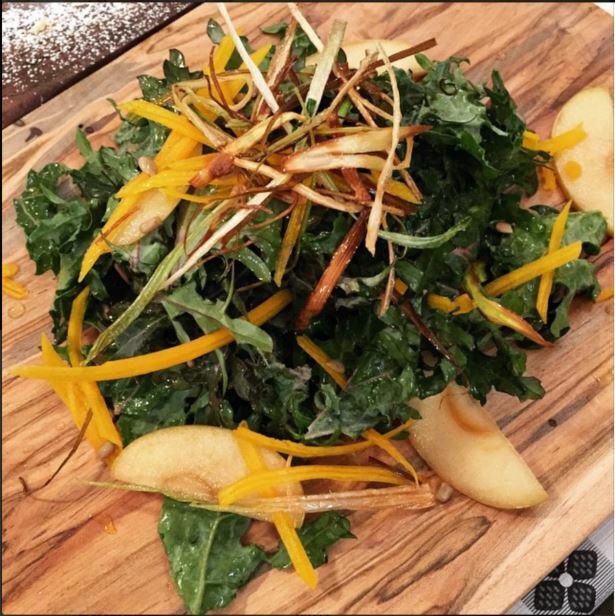 His current chef salad featuring local Russian red kale, shaved squash, fried leeks, local apples and a basil-grapefruit viniagrette is pictured below. Our drop of joy is growing before our eyes and will be 11 (!!!) weeks old on Thursday. I’m in a season of transition – working full time, accepting freelance projects and soaking up every moment of family time that comes across my path – and determining and discerning what is next and best for me and our family unit. Our days go by so quickly. The weeks even faster. Being back at work has brought such joys as pumping in the bathroom. Today included confirming my worst fears and forgetting my gear (bottles, valves, etc.) at home and making an emergency mid-morning run to Target to stock up. Yesterday’s adventures counted among them assuring a coworker through the stall door that I was pumping and not hyperventilating and the sound she was hearing was my machine not my own guttural sobs. Then answering questions about the process whilst still pumping. Later I spilled milk across my lap. “No, friends I did not pee myself. I spilled my own milk.” – not necessarily better than peeing oneself when explaining. All in all things are very successful in this realm. Crispy Pork Ramen – But wait! Has it not been but two weeks since this was last created in our kitchen? Yes. But that felt far too long. Chicken Tikka Masala – Although the above ramen has perhaps knocked it out of first place as my favorite one-dish crockpot meal, we love this chicken tikka masala, and with a high yield, it makes great second night dinner and leftover lunches. It also freezes great! Red Curry Meatballs – This was my first go round with a Real Simple meal, and it was pretty good! I would consider making it again due to its ease and high convenience factor. I amped it up with an extra shot of red curry paste and a spoonful of samba oleyk. Spicy Smoked Sausage Pasta – I love this pasta. We don’t eat much pasta around our house (again, the above ramen not withstanding), but I love this cheesy pairing with spicy andouille. Cuban Sandwich Sliders – Not only is my friend Lindsay beautiful and stylish and mom to maybe the cutest boy I’ve ever seen (Nora Beth is already hoping for a date with him), she has a blog full of awesome meals including these cuban sliders. I prepped the pork and cooked it over Saturday night and made 12 sliders after church on Sunday. 6 we kept for us and ate for lunch and a later snack, and 6 we took to friends with a new baby. The pork was so flavorful, and even though I ordinarily hate both pickles and mustard, I can’t wait to make these sandwiches again!